Taiwanese mobile phone manufacturers latest offering has come to Indian shores. The dual SIM and Sense UI 5 equipped HTC Desire 600 has been launched in India for Rs.26990.00 with a online buy option of Rs.25,581.00. If you are interested then read on. The HTC Desire comes with a Super LCD2 4.5 inch display with 540 x 960 pixels resolution(~245 ppi pixel density). The Desire 600 has a 8MP camera on the rear and a 1.6MP one on the front. The Rear camera is 3264 x 2448 pixels has autofocus and LED flash. It can shoot 720p videos @30fps. On the inside the HTC Desire 600 is powered by a Qualcomm Snapdragon MSM8625Q 200 clocking 1.2GHz quad-core Cortex-A5 processor and runs on 1GB RAM. It has a internal memory of 8GB and a microSD card slot for expansion upto 64GB. 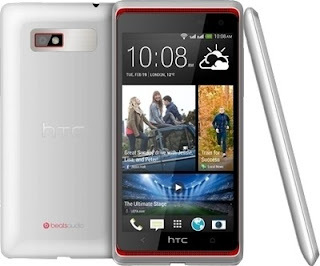 The Desire 600 will come with now famous HTC Sense 5 UI alongwith the HTC's latest offerings the Blink field and the Boom Sound. It will have two speakers on the front like the ones on HTC One along with the Beats Audio integration. In fact this is the first mid range smart phone from HTC stable to feature the above three. The BlinkFeed brings more then 10000 articles per day to you including feeds from MTV, FT, AOL and Reuters. The HTC Desire 600 comes with dual SIM capabilities and this phone allows you to have the two SIMs active at all time which means that you can receive a call on one line even if you are already on call on the other. This is a good phone from the HTC stable but in my view, priced a little on the higher side. But if you still feel that HTC Desire 600 is the one for you, Flipkart is offering it for Rs.25,581.00 with COD and EMI options and delivery within 3 days.